With Wi-Fi baby monitors bringing all kinds of futuristic features to the nursery, radio-based models have had to be more creative to keep up. 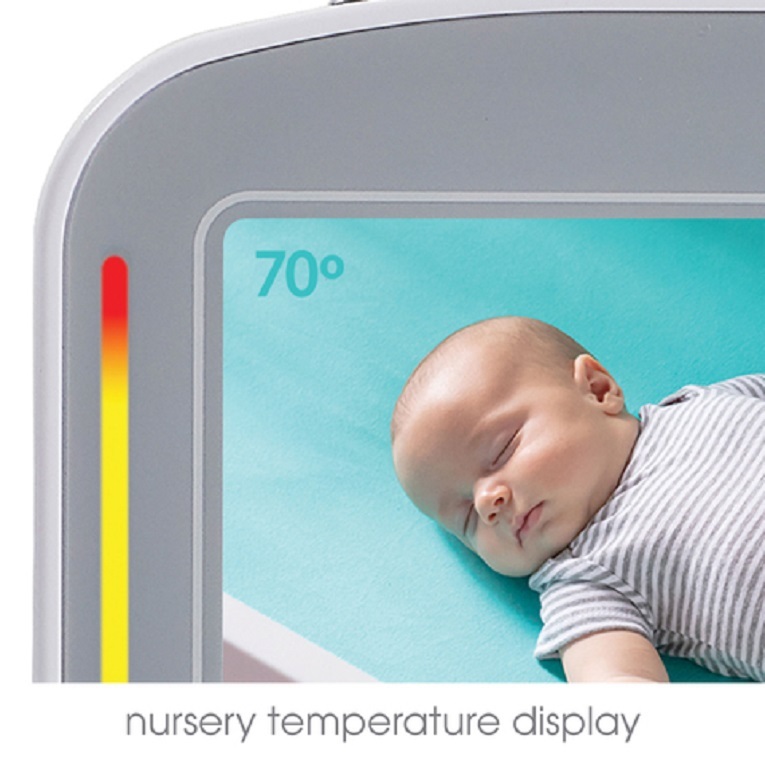 The Summer Baby Pixel Cadet ($170) adds some high tech to its conventional setup with a SleepZone Virtual Boundary feature that alerts you when your baby moves outside of it. 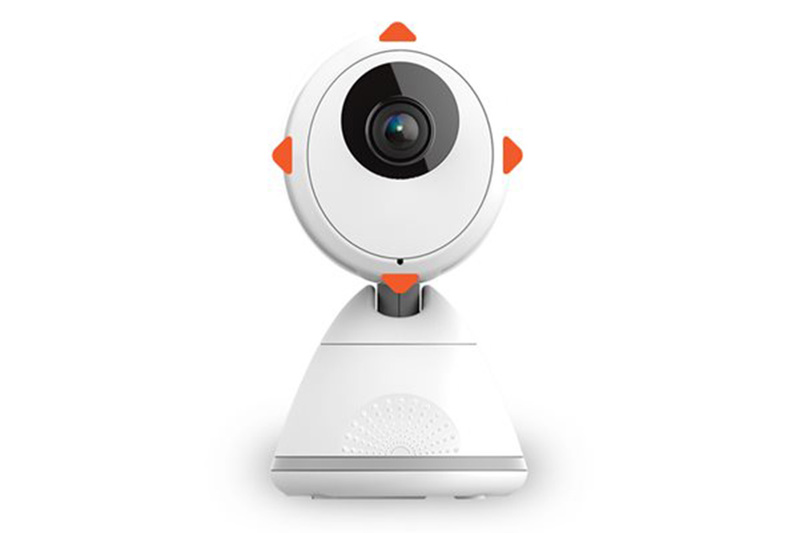 The linchpin of the Pixel Baby Cadet is a pan-and-tilt camera. 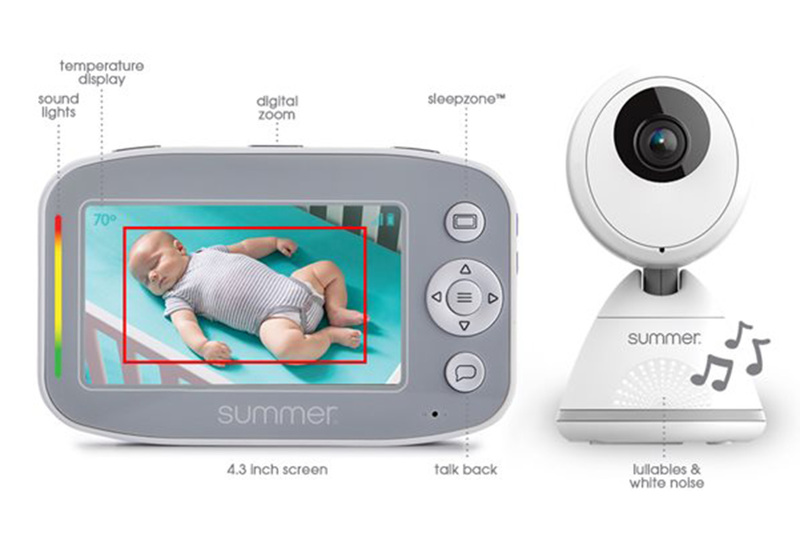 It can be steered remotely from the handheld parent unit to provide a complete view of the nursery, and it has a 3x zoom for getting a closer look at your child. It also has a built-in speaker, so you can settle your baby with your voice without needing to enter the room. Alternately, the camera can play musical lullabies and white noise to soothe your baby to sleep. You’ll mostly be spying your little one during the night, so the camera also provides automatic black-and-white night vision so you can see clearly in little or no light. The parent unit has a 4.3-inch digital color screen and is small enough to carry around comfortably. If you’d rather set it down on a table or counter, there’s a flip-out stand on the back. The unit runs on rechargeable batteries. In addition to providing a window into your child’s room, the monitor also displays the room’s temperature, along with the camera’s current zoom setting, Wi-Fi signal strength, and the monitor’s battery level on the screen. A strip of sound-activated lights to the left of the display indicates the level of noise in the room. The marquee feature, though, is the SleepZone Virtual Boundary. This sets a “safe space”—visible on the screen as a red rectangle—around your baby. If they move out of it by rolling into a corner or trying to climb out of their crib, the parent unit emits an audio alert. The setup for the Baby Pixel Cadet is like most video baby monitors—you plug the camera and the parent unit into AC power and they automatically recognize each other. It’s recommended you charge the parent unit for seven hours, and each charge gives you about seven hours of use. Operating the camera from the parent unit is a cinch for even the most sleep-deprived parent. A directional pad next to the screen steers the camera, and buttons for the talk-back feature, volume, lullabies, and zoom are set in the front, top, and sides of the unit respectively. You activate the SleepZone Virtual Boundary by pressing its dedicated button above the directional pad. The first time you use it, a dotted-line overlay appears on the screen. You’ll need to steer the camera to the crib until your child is enveloped within that overlay, and then press the button again to set the boundary. After that, you just press the button to turn the boundary on and off. The virtual boundary worked infallibly in my testing. Each time it was breached, I was alerted with a gentle, sonar-like beep from the handheld monitor. You can adjust the size of boundary box (there are two size options) and the volume of the alerts using the directional and menu select buttons. The camera includes a total of five “lullabies”—“Brahms Lullaby,” “Twinkle, Twinkle Little Star,” and three white noise options—you access by holding down the lullaby button for a couple of seconds. You play your selection by pressing the lullaby button on the unit or the one on the camera itself. The songs aren’t audiophile quality but they’re pleasant, and they’re quiet enough that they shouldn’t disrupt a child’s sleep. After 30 seconds of silence, the parent unit’s screen will darken. If you have the voice-activation feature enabled, though, it will wake up when your baby stirs and makes sounds. All that said, don’t expect top-shelf image quality. It’s actually fairly noisy, with rather dull color. You’re not saving these images for posterity, though, and the quality is certainly good enough to give you peace of mind. Night vision, too, is adequate enough to let you see clearly in the dark, and the infrared lighting won’t disturb your sleeping bundle. Though the Baby Pixel Cadet comes paired with a single camera, you can add up to three more, using a syncing process found in the menu options. Each camera is numbered, so should you expand your family and your camera count, you just select the appropriate view in the menu settings using the directional buttons. The Baby Pixel Cadet proved easy to use and reliable—critical qualities when the safety and comfort of an infant is at stake. That’s plenty to recommend it. It’s not a small investment, however, especially if you’re going to add extra cameras at $110 a piece. Our top pick in this category, the Arlo Baby, is currently available on Amazon for just $179.95—that’s less than $10 more than the Baby Pixel Cadet—and that camera gives you full HD video, app control, and a host of sophisticated features. If that’s more tech than you need, though, and you’re just going to stick with basic one-camera setup, the Baby Pixel Cadet is a fine choice. The Summer Baby Pixel Cadet is welcome addition to the nursery but adding extra cameras can get costly.